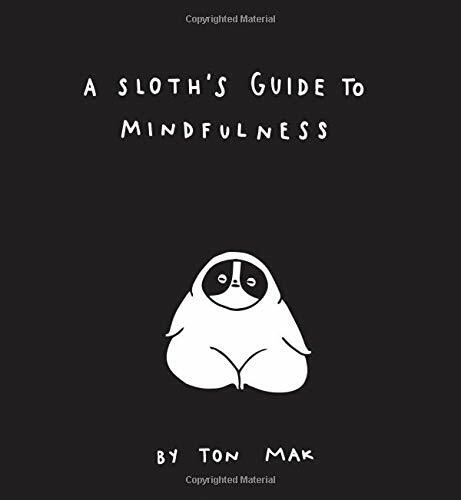 Ton Mak’s A Sloth’s Guide to Mindfulness is an absolutely delightful gift book, suitable for your friends who meditate and those who are considering starting a practice. Sometimes, we all feel like sloths. In Mak’s world, sloths are kind and gentle. They are also occasionally overwhelmed by the workday, expectations, and “adulting.” Sloths are not only slow moving, but also agreeably fat. There are days when sloths simply need a break. To create that necessary calm in the turbulent seas of life, Mak and her sloth suggest a mindfulness practice. Mindfulness is placing our attention on the present moment. It is sitting, without expectation, and watching the thoughts that race through our minds, pass. It is a state in which we do our best not to judge—ourselves or anyone else—and when we fall out of that state, we notice it and let that go too. Though the text is unassuming, it is not fluff. Mak knows her material, sharing quality information about the reasons why someone might want to meditate, how to meditate, what to expect during meditation, and the benefits one might feel after starting a regular mindfulness practice. The book is a small, square volume filled with black and white images of one of the author’s family of “flabjacks,” the sloth. The writing is unpretentious and pairs well with the images that Mak has created. In every way, the book is visually appealing. The writing is superb, but it is the images that steal the show and make this book something your friends and family will enjoy receiving. Like all great artists, Mak creates images that hit home. The sloth is charming and relatable. With the turn of every page, the reader is bound to smile. The pictures and text together are heartwarming. Any friend or family member who enjoys meditation—or who might appreciate a gentle nudge in that direction—will smile thumbing through A Sloth’s Guide to Mindfulness by Ton Mak.